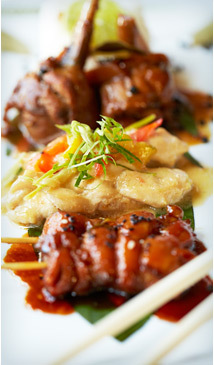 Asian cuisines are all about harmony and balance, but each different cuisine accomplishes this in its own singular way. 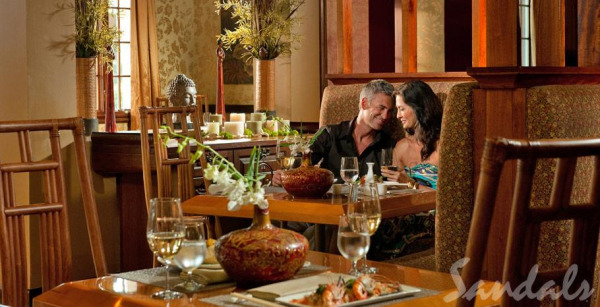 Whether finicky or adventurous, bold or timid, hearty or healthy, there is an Asian cuisine to suit every approach to dining - and Sandals offers them all. In Thai cuisine, achieving the perfect flavor for any dish relies upon a balance of four basic tastes: sour, bitter, sweet and salty. Intricate fruit and vegetable carvings add the finishing touch to Asia's most elaborately decorated plates. Clean, natural, unspiced flavors define Asia's most healthful cuisine, Japanese. 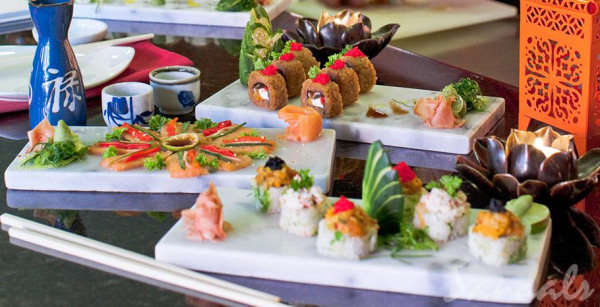 Soy Sushi Bar (Sandals Grande Riviera, Ocho Rios, Jamaica) Tucked Away behind bamboo fronds and adorned with unique oriental décor, Sandals and Beaches Resorts brings a taste of the Far East to the Caribbean. 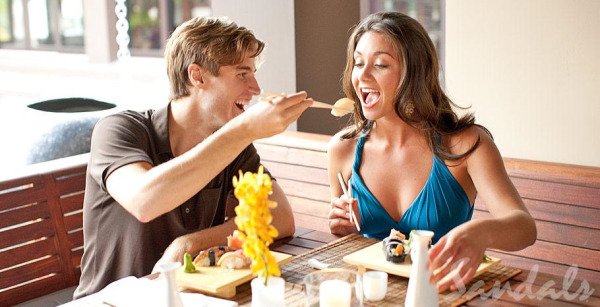 Named after Soy Sauce, a traditional ingredient in the art of Sushi, Soy offers exciting flavors and exotic sushi creations made to order. Skillfully prepared using only the freshest and most delectable ingredients, it’s no wonder Soy is such a popular option amongst our guests. fun. 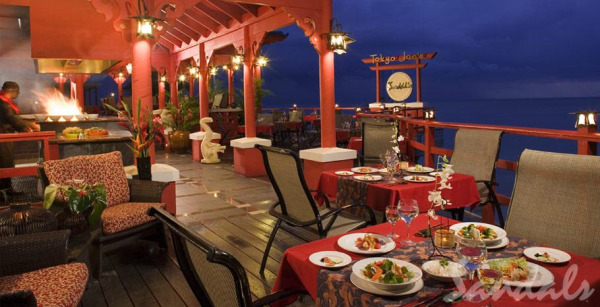 Jasmines (Sandals Whitehouse, Jamaica) Traveling all the way from Laos’ village of Thakket, this Asian-inspired Restaurant offers a unique culinary experience that transports you to the exotic locale of Southeast Asia. Taking elements from Thai, Malaysian, Philippine, Southern Indian & Japanese cuisine, Jasmines’ famous Pan-Asian dishes bring together a unique blend of flavors and an exotic flair that will keep you coming back for more. 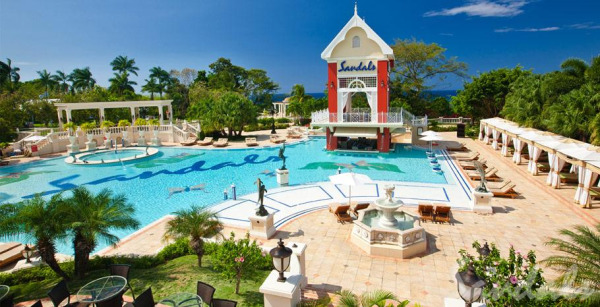 I'm thrilled to introduce to you Sandals Grande Riviera Beach & Villa Golf Resort in Ocho Rios, Jamaica - the newest resort in Jamaica. 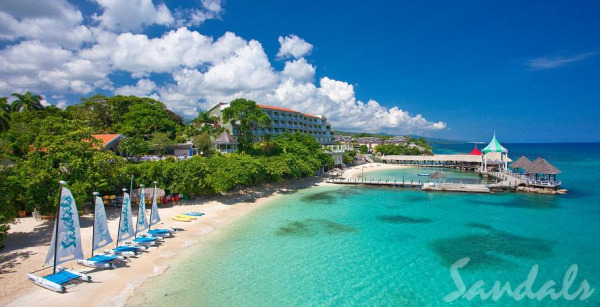 Many have previously known this resort as Sandals Ocho Rios, but with its recent 60 million dollar renovation, the transformation is on such a grand scale, the enhancements so impressive, the resort had to have a new name. 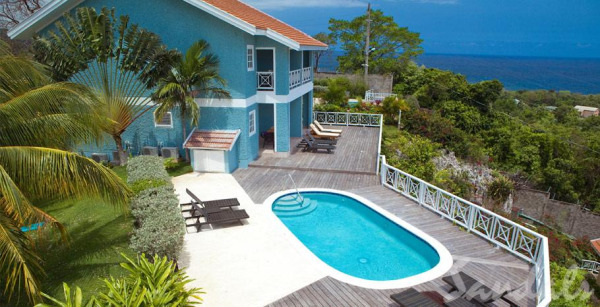 The Sand Lady's clients love this resort because it offers three distinctive vacation experiences: an oceanfront garden oasis called the Riviera Seaside, the hill-top Great House and Riviera Villas, and the hip new Ochi Beach Club. 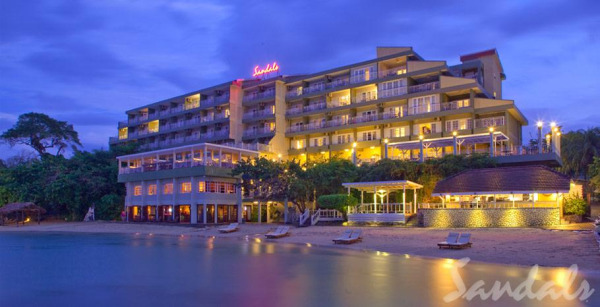 Sandals Grande Riviera is located on one of Jamaica’s most sought-after stretches of coastline. Known as the Caribbean Riviera, the resort's endless alabaster beaches and crystal-clear waters host living coral reefs. A Grande Promenade stretching far over the sea allows you to stroll above the tide as soft ocean breezes calm the soul. Here, you may relax in diverse settings at seven sparkling pools and the resort’s best-kept secret: a hidden grotto pool tucked into the dense shade of a secluded garden. Also on Riviera Seaside is Honeymoon beach. This is the most beautiful shoreline on the property. One day you will choose from the many water sports included in your stay and the next you will relax on the beach while you enjoy a tropical drink and the companionship of your loved one. 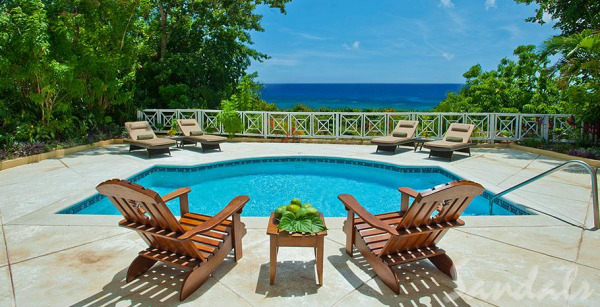 Tucked in the lush hillsides of Ocho Rios, the Great House and the Riviera Villa Suites with their 93 private and semi-private pools offer a unique blend of privileged seclusion and unparalleled luxury. Accommodations at the Great House feature a one-acre, zero-entry pool and swim-up pool bar. The serenity of relaxing in your private pool-side cabana is an experience not to be missed. Enjoy a Great House suite with balcony overlooking the pool or relax beside your own private pool in one of the Riviera Villa Suites, hidden from the world, surrounded by trees and countless species of butterflies. Nothing could be more magical than a midnight swim, just the two of you with a chilled bottle of champagne and the scent of night-blooming jasmine all around you. Whether you choose to stay in the Riviera Seaside accommodations, at the Great House or in the Riviera Villa suites, you will NOT want to miss the all new Ochi Beach Club. 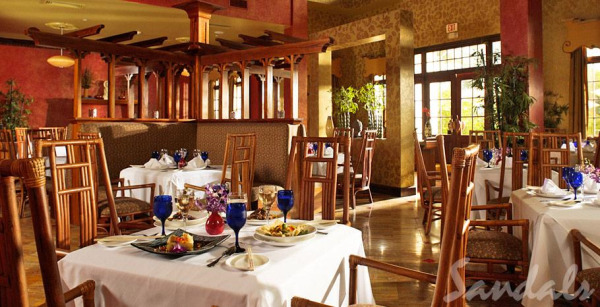 The most exclusive club in Ocho Rios is also the sexiest. 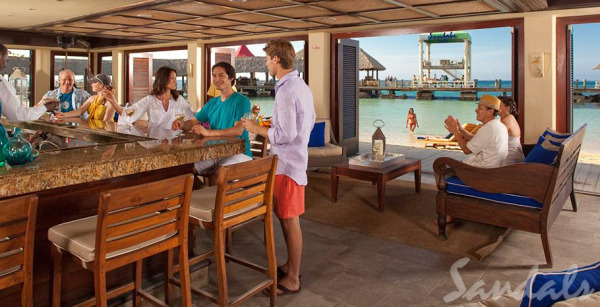 Welcome to Sandals' Ochi Beach Club – a seaside world of chic sophistication. 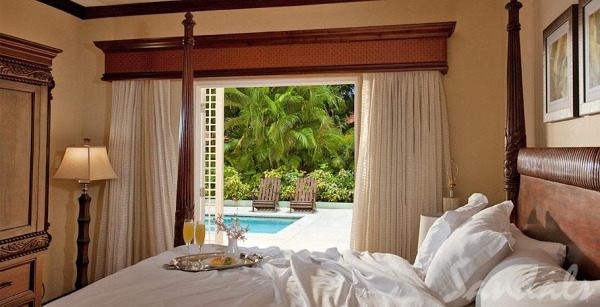 Sheer linen curtains waft gently in the sea breeze as you lie on the divan of your private cabana. 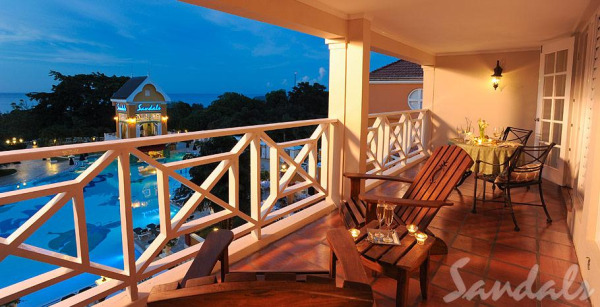 Newly found friends gather to sip ice–cold dry martinis on the sun deck overlooking the sea. And when the sun goes down, "Ochi" burns even brighter. 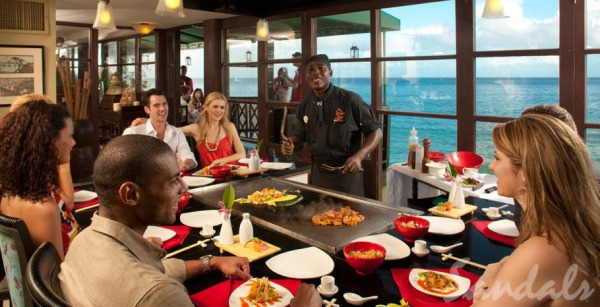 Enjoy a sensational dinner at the new Kimonos restaurant then dance to the pulsing rhythms of reggae performed by Jamaica's top performers. Already Sandals Grande Riviera Beach & Villa Golf Resort has been named one of the top hotels in the Caribbean by Condé Nast Traveler’s Reader's Choice Awards, and just recently TripAdvisor has awarded it a Certificate of Excellence. 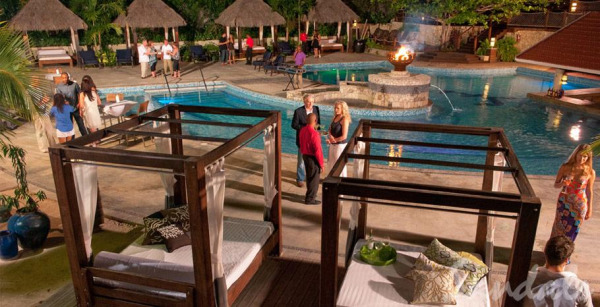 Contact Us today to plan your Caribbean vacation to one of Sandals all inclusive resorts built for romance.